Marvel Ultimate Alliance aside, the only games I've brought in the last handful of years are those from the God Of War series. 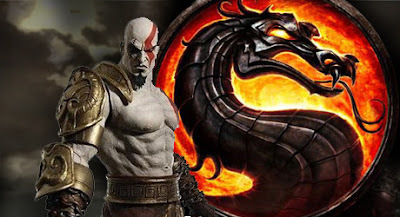 Kratos and his bloody trek through the Gods and realms of myth is highly addictive stuff, and now he's set to tackle a few more as the latest kontender to the world of Mortal Kombat. If this franchise relaunch leads to being able to pit Kano against Kratos with a forward, back, back, button combo or two then I'll definitely be looking in it's direction come 2011. Alan dug up the Arkham City trailer too. Absolutely amazing, right down to the rain pelting off the cowl as he dives from rooftop to rooftop. ...and Kratos in Mortal Kombat? Two great tastes that taste great together. It's like a Peanut Butter cup of gratuitous violence. Mmm peanut butter. Talk about inventions that should've won a nobel prize! Glad you liked the vids Craig!